These PC’s are more privy to become worn, cracked or produce dead pixels. Next thing you know, the LCD screen of your PC may look like a throwback film! Unless your into silent movies, let our trained technicians turn your vintage hassle into a modern masterpiece. 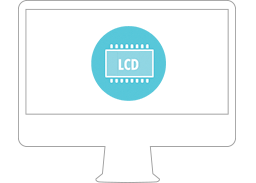 We can replace the LCD efficiently and effectively for long-lasting durability.